Our kids’ footwear selection is purpose built for mini explorers that are never deterred by muddy puddles or outdoor tumbles. 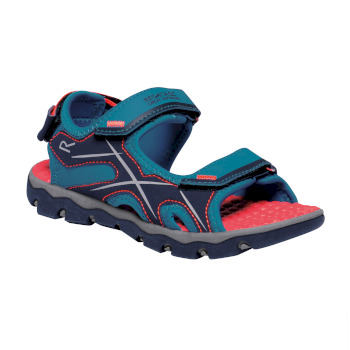 With a varied selection of children’s wellies, walking shoes, and sandals, it’s easy to kit out the kids with supportive outdoor footwear that they’ll love too. Heading out for a family camping trip? Or just want to make sure that the children have a reliable pair of shoes for their garden antics? 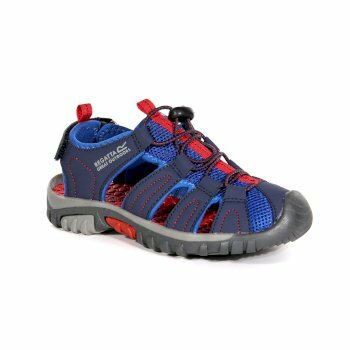 Shop our complete range of children’s walking shoes and boots in varying colours. Our Regatta walking boots for kids are hard-wearing with a breathable membrane for guaranteed comfort. And extra cushioning for every hop, skip, and jump they take. With tough rubber overlays and super-gripping soles, you can rely on our kids’ walking boots and shoes to keep on going, even when the kids are tuckered out. Do the children need something a little less confining to keep them light on their feet? Browse our range of kids’ comfy trainers and lightweight walking shoes from leading outdoor wear brand, Regatta. With plenty of options to choose from, they’ll keep the kids protected during their outdoor play. Our lightweight kids’ walking shoes are designed with built-in toe bumpers and secure shockcord laces that keep nimble feet secure, whatever outdoor quest they’re on this weekend. The Great British weather doesn’t have to mean keeping the kids cooped up. Choose some trusty kids’ wellies from our latest range to make sure their feet stay warm and dry. Our children’s wellies are purpose-built for curious explorers – even when the weather takes a turn, the children are well equipped with the protection they need to take on park puddles and make the most of their outdoor antics. Buy the children some sturdy outdoor footwear that will stand the test of their rough and tumble. Alternatively, discover our kids’ outdoor clothing collection.